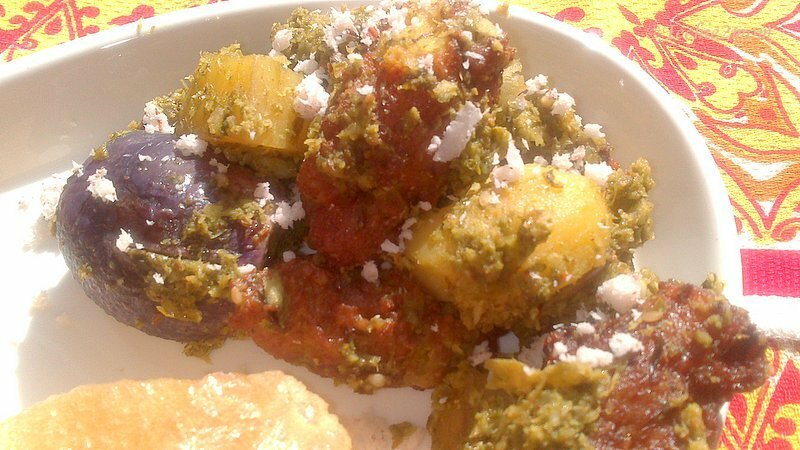 This Gujarat special food is my all time favorite….Come winters and we would start asking mom about Undhiyu!!! For me, any Uttarayan celebration is imcomplete without Undhiyu…And no, that mix of sundry vegetables swimming in the oil, and sold as Undhiyu is not the real Undhiyu, at least not for me (No, You don’t add tomatoes and Tindola to Undhiyu!!! )…If consuming as many veggies as possible is your motive behind making this, then you can go ahead and do that but then please don’t call it Surti Undhiyu…. 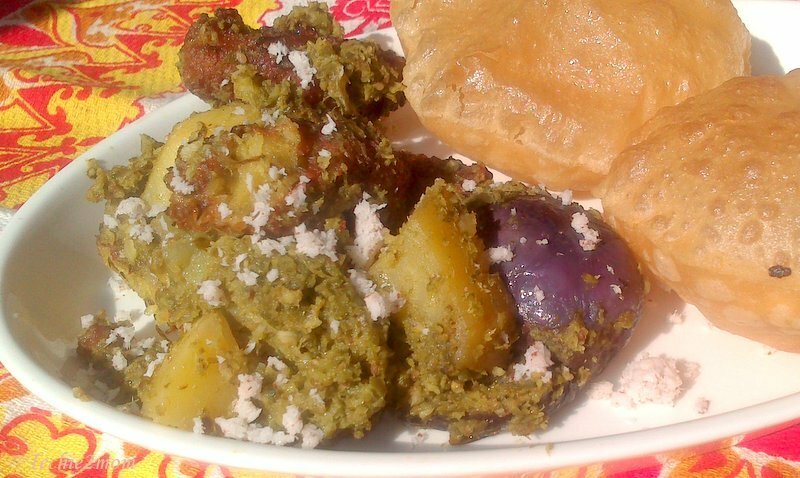 For me the real Undhiyu is the one that mom makes and her mom and grand mom and their mom and grand mom made!!!! One spoonful of it in your mouth and you know, why me (and so many others) are fan…You will feel rich flavors exploding in your mouth, something melting here, something crunchy there…. Pure Bliss!!!! To recreate this magic in your home follow this recipe…. 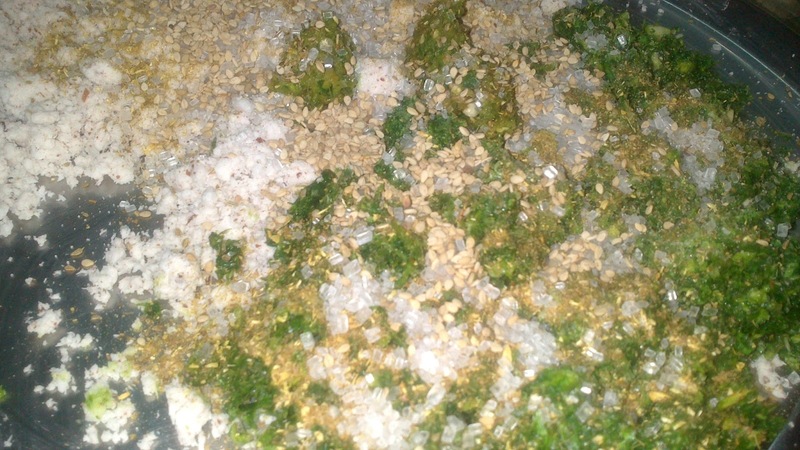 1) Take Cilantro, garlic (dry and spring) churn in mixy to get a coarse paste. Don’t add water. 2) Take out this paste in a big plate and add everything else mentioned under Masala. Mix everything well. 3) Now, take small round brinjals (Ravaiya), remove it’s top and make a cut from top towards bottom carefully. Don’t cut it all the way, it should not be cut completely, at bottom leave it uncut. Then make another cut (so as to form a + sign on top) similarly. Leave the bottom uncut. 4) Add everything else mentioned under vegetables in the plate of masala. Mix well. 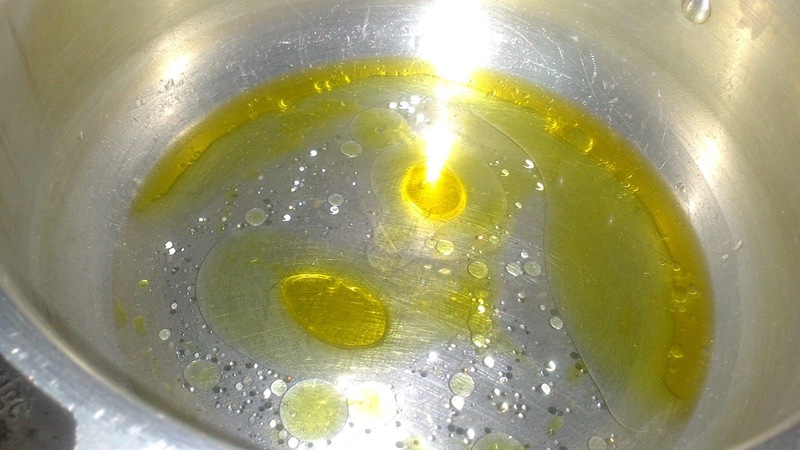 5) Take a thick bottomed pan (i use my pressure pan), in that add oil and water. Heat it on low flame. 6) Once it heats up, add the small round brinjals (Ravaiya) carefully in the pan. Then add other vegetables in the pan. 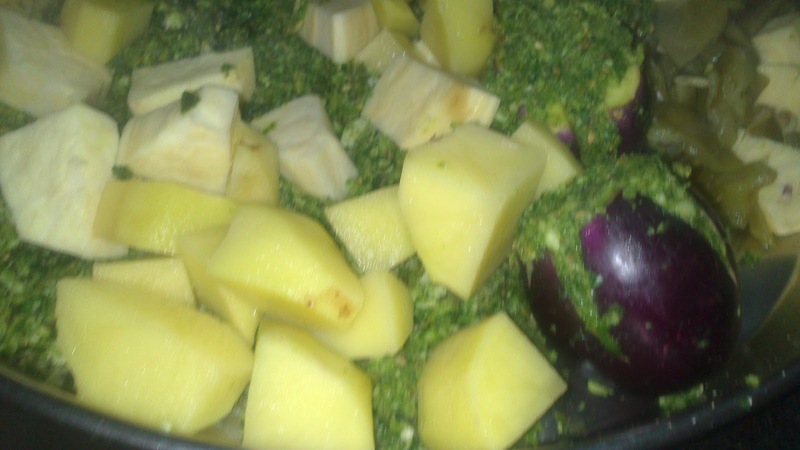 7) On the top carefully put Methi Muthiya. 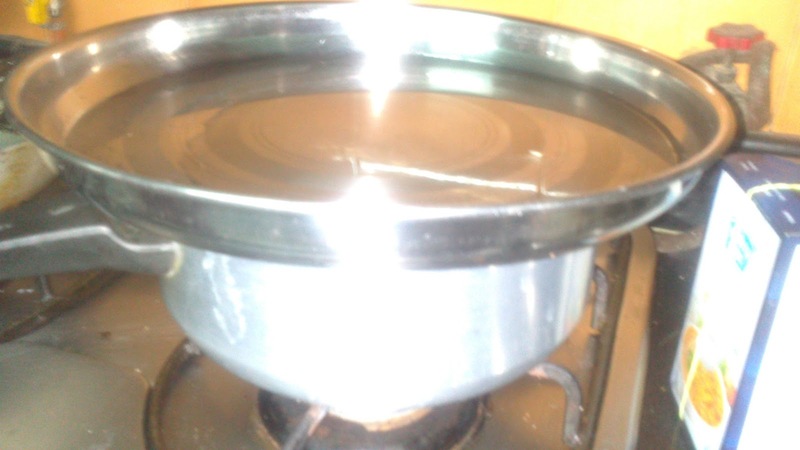 8) Cover the pan using a big plate and in that plate add 3-4 tablesppon of water. 9) Cook covered for 1 hour. In between carefully stirring, while enjoying the heavenly smells of Coconut mixed with Garlic mixed with cilantro!!! But carefull with stirring please, otherwise your muthiyas will break. 10) Once your vegetables are cooked take out carefully, garnish with grated coconut and enjoy with Puris….Yummm!!! 3) Even after your vegetables are cooked, you have water left in the pan, then remove the covering plate and cook on the low flame till the water evaporates. 4) In case you are not able to find Surti Papdi where you live then you can use other Papdi (Sem Phalli/Broad Beans…), sadly you can’t call it Surti Undhiyu then, but happily it still remains tasty!!! Next Post: Baking for Beginners…. Thank you so much for this informative post. it will really really help the reader. Thank you so much again , i fount the same topic About undhiyu on another site.